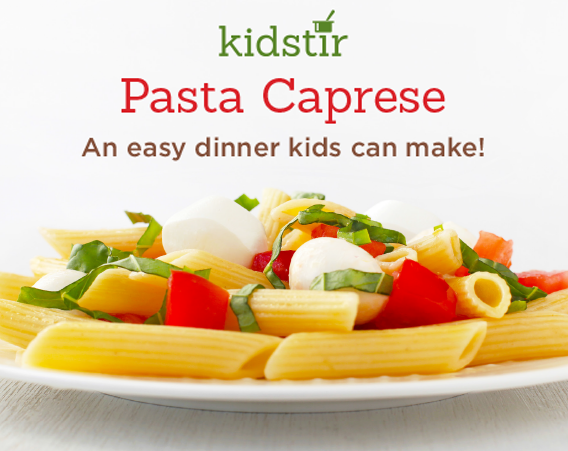 Have the kids help you whip up dinner tonight with this easy Italian recipe. Top your favorite pasta with a simple caprese sauce of fresh mozzarella, tomatoes, and basil. Dinner's ready! 1. Cut the mozzarella into bite-size pieces and place in a large serving bowl. 2. Snip the basil leaves with clean scissors and measure about ⅓ cup into the bowl. 3. Add the olive oil, tomatoes, garlic, and salt to the bowl. Stir well and add more salt to taste. Set aside while you cook the pasta to let the flavors blend together. 4. Cook the pasta according to the package directions. Drain, then toss the warm noodles with the mozzarella and tomatoes. 5. Serve in bowls and pass the parmesan cheese!